It's day 3 of the Waltzingmouse Stamps April release previews, today we're back to the men and previewing the new set - Man of the hour. This set is all about the sentiments, it's jam packed with thirteen of them! Masculine cards can be challenging, I like to keep mine earthy, natural with lots of texture. This is one big sentiment stamp, here I stamped it onto some white cardstock and inked the edges with Scattered Straw Distress Ink. It's layered onto some patterned paper and a piece of burlap fabric that I frayed at the edges and inked. The background cardstock is from Core'dinations Tim Holtz Kraft-Core Nostalgic Collection embossed with a texture embossing folder and inked with Distress Inks. For my second card I again focused on natural materials, this time wood. The background cardstock again from the Core'dinations Tim Holtz Kraft-Core Nostalgic Collection, I embossed with a woodgrain embossing folder, sanded and inked with Scattered Straw Distress Ink. 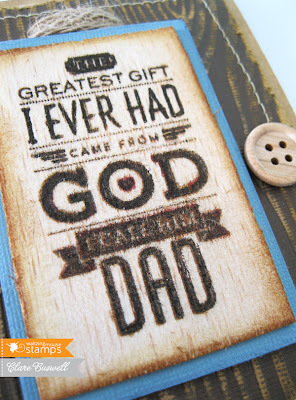 The sentiment is from the new Man of the hour and I stamped it directly onto some balsa wood. I was going for a burnt wood effect (Pyrography). I stamped it twice once in Coffee and once in Jet Black. I then went over some of the detail with a hand embossing tool to deboss it. I wanted it to bleed a bit so I used some Distress Markers to highlight a few details then spritzed once with water. The edges I inked with Distress Inks. Here are the links for DT members sharing samples today. Tomorrow's release day! See you then! Brilliant cards, all the texture on them is really great! Gorgeous cards Clare - love the different textures too. Great rustic look on both cards Clare! Such a neat set! I love the frayed burlap under the sentiment. I love your pyrography technique! Wow, gorgeous cards! I adore all the texture! Fab, can't believe you used real wood! 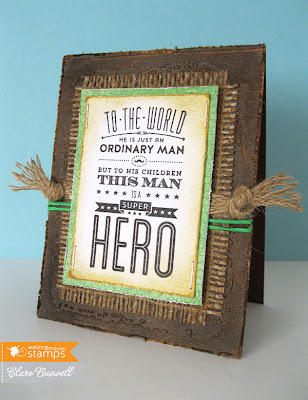 Love the pyrography effect! I have a pyrography tool...never used it though!!! Lovely cards! Love the balsa wood! Need to try this! Wonderful textures in these cards! Wow, I love what you created!!! WOW! The texture on these is incredible, Clare! 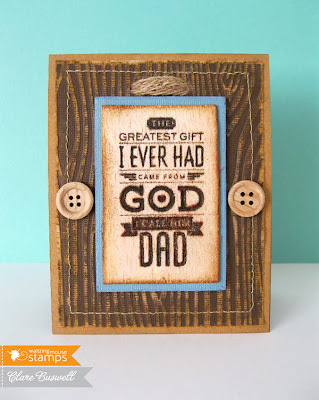 Love the stamping on the wood, such a gorgeous look...like those letters were carved right into it. Between you and Tosh with your Tim Holtz Coredination cardstock, I know what will be next on my shopping list now, TOO! Hope some of your creativity comes along with the package :)!! I'm echoing Kelly here but WOW!!! 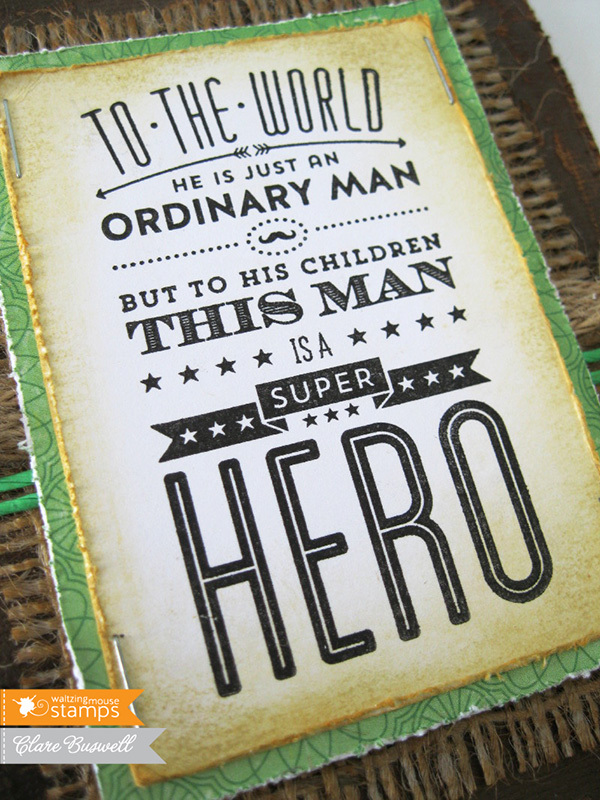 Clare, the textures on all these 'manly' cards are amazing! What wonderful detail - they're a treat to look at! My dad would love these cards. Way cool!